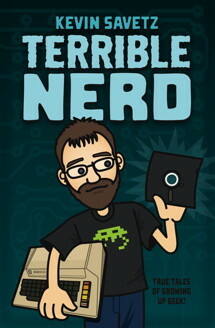 Terrible Nerd is tech journalist-turned-Web publisher Kevin Savetz’ biography of personal computing, gaming, and online adventures as a child in the ’80s, and follows the author as an Internet pioneer in the early ’90s and into his present-day Web success. Rich in detail, personal memories, and computer specs, this is the story of a boy coming of age in the dawn of home computing. This tech memoir gives readers a front-row seat to a self-confessed geek’s early experiences with computers, from his dad’s beloved Atari 800, to an ill-gotten Texas Instruments 99/4A, to Kevin’s first Apple //c in 1984. Accessible to non-techy readers and computer nerds alike, this treasure trove of memories shows how growing up as part of the first computer-native generation shaped friendships, hobbies, and, ultimately, a career. In fascinating detail, Kevin recalls his brushes and friendships with computer greats, BBS gurus, and pioneers of the worldwide web. He reminisces about text adventure games such as Zork and Hitchhiker’s Guide to the Galaxy, and the early 8-bit era of M.U.L.E. and Jumpman. Terrible Nerd brings to life late nights experimenting with code in front of a glowing monitor, hacking the school computer to dial into BBSes, causing trouble on college radio, a stint as AOL’s Internet AnswerMan, and hosting a team of Microsoft suits in his small-town home office. Whether he’s begging TRS-80 time from a middle school librarian or lobbying his mom for a modem (stupid WarGames! ), Kevin brings his experiences to life, writing with insightful candor and historical accuracy. While other guys were chasing girls, Kevin was typing in pages of code from computer magazines, swapping software, programming in BASIC, and scouring newsletters for clues to text adventures. Terrible Nerd celebrates an era in all its geeky glory. You’ll enjoy following along as Kevin flunks out of P.E. class, gets busted for reading the Intellivision game catalog at church, and accidentally crashes the Internet for all of Europe – yet ultimately triumphs and even gets the girl. It is now available on Amazon.com. The author read an excerpt of the book at a recent Commodore Computer Club meeting (http://commodorecomputerclub.com) in Vancouver, WA last week and I was really impressed – impressed enough that I have ordered a copy via Amazon and really looking forward to reading the rest of the book. Indeed, Laura, Kevin is pretty awesome, just like his book. I’ve finally finished it myself, however I’m looking forward to there being an iPad and/or PDF version. You’ll really enjoy reading the rest of the book for sure! I would love to see an iBook. This book looks great. I hope to be able to afford it one day but at the moment unemployment and 2.9 kids (one due soon) will keep me from making the purchase. I heard about your book on Retrobits. I remember those wonderful, magical early days of Atari and tech in general. I have a tonne of stories but suffice to say, they were very special. Today, I got the Kindle version of this book. I could not put down my Kindle till I finished reading it. This book brings back memories of all the “ancient” technologies I used in my college days.. the modem, the text based browsers, MUDs and MOOs text based adventure games,dBase, BBS, 80 character monitors, gopher..Those were the days..Loved the book and thoroughly enjoyed it. Thank you Kevin for bringing back those days so vividly in your book.